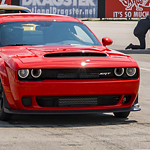 One of the most popular and recognizable muscle cars on the road today in the Dodge Challenger. And while the sheer power of this car is often the focus of the car buyer, the amazing interior of this vehicle should not be underestimated. That is why our team of muscle car experts at Glassford Chrysler located right here in Ingersoll are so excited to announce the arrival of the new 2019 model. The Challenger offers contoured seats designed to comfortably cradle your body as you drive whether it’s to the office in the morning or just for a Sunday joy ride. Also, Dodge offers five different interior colour and design combinations. This lets car owners truly customize the interior of the car to match their personal style and make it their own. Finally, the heated front seats will make even the coldest morning commutes to work more enjoyable for the consumer.